The Apple blossom (Pyrus coronaria) is the flower of the apple tree. It is a beautiful, fragrant pink and white flower. 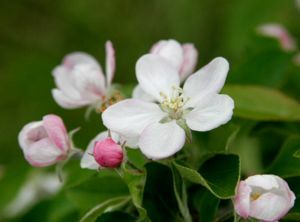 Two states have named the Apple blossom as their state flower. In 1897 Michigan legislators named the Apple blossom as Michigan's state flower, and in 1901 it was named as the Arkansas state flower. This page was last modified on 27 June 2016, at 10:03.